Simon Holt discovers that just a few blocks from Australia's most glamourous beachside strip are some elegant holiday homes in the silence of suburbia. Wanderlust, Elite Holiday Homes, Gold Coast. It used to be an elitist thing, living in a multimillion-dollar home on one of the Gold Coast's many canals. Not everyone can afford the price tag, but most can experience a taste, particularly if they're able to organise a group. 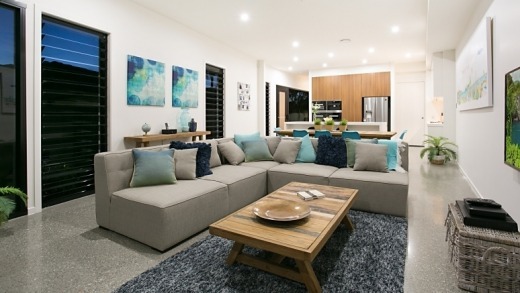 Elite Holiday Homes are scattered throughout the Gold Coast, with the highest concentration at Broadbeach. But it's important not to think of busy Broadbeach central, which is a few blocks away. This is residential central – quiet streets at the front, and calm canals at the back. Rooftop bars are all the rage among the hipster set. Wanderlust has one of its own, complete with stools, a comfortable day-bed, yet without the hassle of bar queues or – depending who you associate with – clumsy types who insist on spilling beer down the back of your shirt. 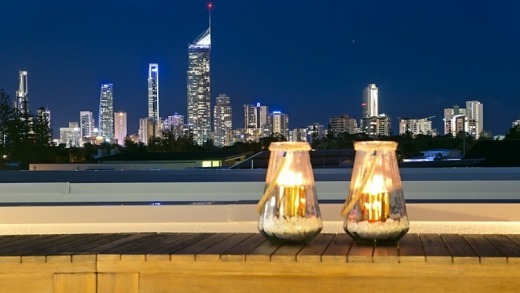 The rooftop has a pool table, bar fridge, large television with cable, and a view which overlooks the highrise-scattered skyline of the Gold Coast. Downstairs, there's a mooring for your make-believe boat, and a plunge pool. This place is built for outdoor living, with a large outdoor setting and barbecue on a deck overlooking the pool and canal. Unlike the third-floor rooftop, this space is covered for the rare days Queensland does get a little bit of rain. Luxury living in a holiday home is a taste of lifestyles for the rich and famous. A modern kitchen complete with walk-in pantry, five bedrooms each with classy interior design chic, three bathrooms, lounge, dining and multiple outdoor areas mean there's space to socialise, yet also plenty of rooms in which to escape. Curtains in the master open to a view of the coast, particularly beautiful at night. A walk-in robe leads to a bathroom with double vanity and shower. The only time you're likely to see hosts is at check-in, but that doesn't mean they're not capable of looking after you. Breakfast hampers are made with local quality produce and are big enough to snack on during the day. While it's possible to cook for lunch and dinner, that would mean missing out on the growing choice of dining options at Broadbeach Central. Mamasan is one of the new modern mix with its relaxed share plate style. It's not related to its Bali namesake which some Australians will be familiar with. There are dozens of restaurants from which to choose, and during the day the newly designed Pacific Fair has a food court which shatters any stigma associated with food court dining. Indoor pergola, anyone? With 70 kilometres of coastline, it's all about the beach. But the Gold Coast is fast becoming about high-end food, some of the finest shopping, and as the Commonwealth Games approaches, the development which comes with economic prosperity. Fun parks are part of it, but they're certainly no longer the limit of attractions. 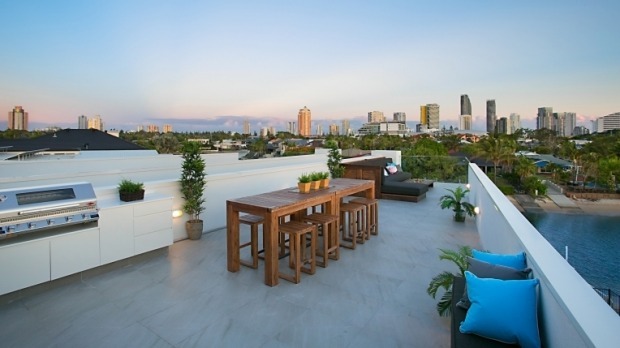 The Gold Coast's glamorous reputation is gaining an elegant edge. Pack the thongs, by all means. But be sure to tuck in some evening wear on the side. It's worth doing the sums. At first, $500 a night might seem like a lot of money, particularly when you're not on the beach. But if you're sharing the cost, perhaps with another couple, the price drops dramatically. With five bedrooms, there's plenty of space to spread out, and a relaxed environment unlike many hotel rooms where there's a compulsion to get out and about. Shopping, restaurants, the casino and tourist spots are within walking distance. It's easy to see why this type of accommodation is increasing in popularity. Sunset on the open rooftop is gold. A little bit of construction next door, but not a permanent thing. The writer was a guest of Elite Holiday Homes and Gold Coast Tourism.